Bionic Arm Restores Sense of Feeling « Adafruit Industries – Makers, hackers, artists, designers and engineers! The men can now delicately pluck the stalks out of cherries. 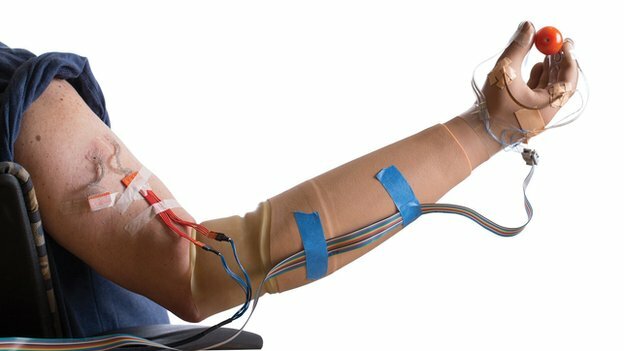 Sensors on the artificial hand are used to send signals directly to the nerves, the study, published in Science Translational Medicine, said. Meanwhile, a Swedish team has made a separate breakthrough in artificial limbs – anchoring bionic arms directly on to the bone to improve control. One of the beneficiaries of the American work was Igor Spetic, who lost his right hand in an accident four years ago. He was fitted with a bionic replacement, but it was incapable of feeling the world around him. He had to carefully watch what he was doing and judge by eye whether he was squeezing too hard. A team at Case Western Reserve University attached sensors to the bionic hand and in surgery fitted “cuffs” around the remaining nerves, which were capable of delivering electronic stimulation.